The Mayor of London Boris Johnson today launched a set of giant Olympic Rings onto the River Thames as he announced a programme of cultural events to celebrate London 2012. 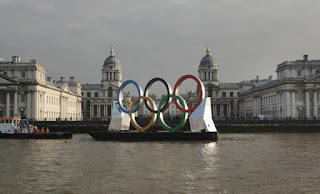 The Mayor of London Boris Johnson today launched a set of giant Olympic Rings onto the River Thames as he announced a programme of cultural events to celebrateLondon 2012. Boris Johnson was joined by Ruth Mackenzie, Director of the London 2012 Festival, to make the announcement. He said: 'We're creating the biggest festival of outdoor arts ever to be seen in the capital, as well as fantastic new work that will throw new light on some of our city's lesser-known landmarks and hidden gems. As part of the London 2012 Festival, the Mayor has commissioned a series of free cultural events called Secrets: Hidden London. Taking place across the city, the programme includes a floating opera inspired by The Owl And The Pussycat and Like a Fish out of Water, an English National Ballet creation capturing the nostalgia of three of London's lidos. Supported by Arts Council England, the Mayor has also created Showtime, London's biggest ever outdoor arts festival, which will see the best of outdoor performance brought to every borough.